I've been to Young, in central-west NSW, for a cousin's funeral. As I drove to Young I was acutely aware of the accuracy of the now-cliched description of Australia in Dorothea Mackellar's poem - that we are a country of 'droughts and flooding rains'. It was raining as I left Sydney and the radio was a constant flow of information about the imminent dangers from floods in Queensland and Northern NSW. 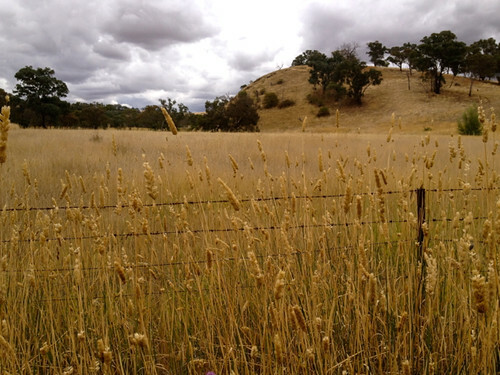 But as I drove further west the country-side changed from green to the gold of stubbled paddocks and dried pasture-land. The grey clouds of my photo brought only a few spots of rain. Not enough to please the farmers. The cousin whose funeral I attended is the first of the cousins of my generation to die. It's a significant marker of passing time. He had a mild intellectual disability and had lived a sheltered, very private life. He was steadfast in his Catholic faith all his life, so that the requiem mass with its well-worn ritual and predictability seemed a perfect last marker of his life - even to an unbeliever such as I. Afterwards there was tea and sandwiches (and later, beer and wine) and gossip among the cousins who are now spread around NSW and whose last catch-up with one another had been the funeral of an aunt from the previous generation of relatives. 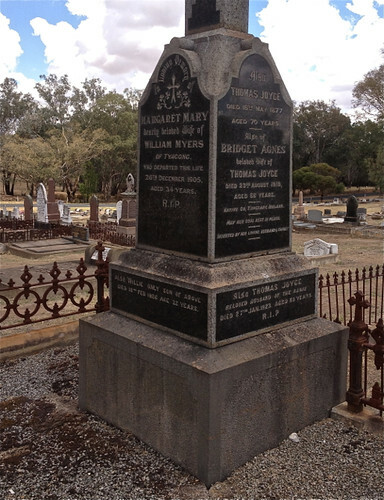 One of my cousins is compiling the family history of this part of my family and took us to see the gravestone of our earliest Australian ancestors in the Young cemetery. 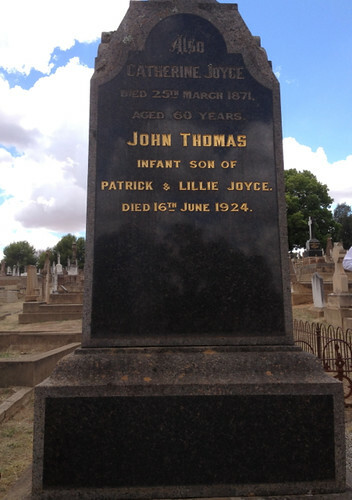 Thomas (1807-1877) and Catherine Joyce (1811-1871), my great-great-grandparents, came from County Kilkenny in Ireland to join their three sons, Thomas, Edward and Patrick who had already settled near Young. I don't often catch up with members of my family of origin, but it's always very reaffirming of my past when I do. Jude Hill uses recycled textiles and her work has a patina of age and past histories.I like her refusal to be pigeon-holed by craft categories - 'weaving', 'patchwork' or 'embroidery' and her 'what if' approach to her work. Spirit Cloth is an extreme example of process-driven craft. Over time there's been a very positive response to her work and she now offers on-line classes for some of her techniques. I've just taken up her class on cloth-to-cloth weaving which is one of her ways of working that delights me. 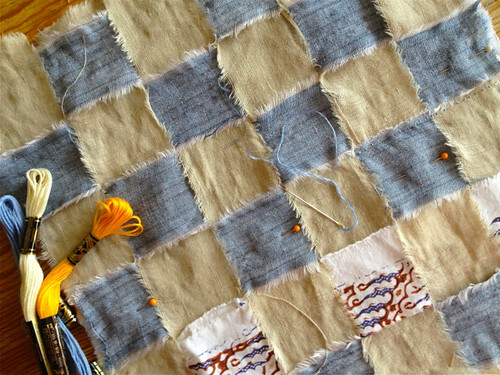 She uses strips of textiles, mainly torn or roughly cut, to weave smallish blocks that can then be combined with other similar blocks to make quilts or table pieces or simply left as they are. The woven bases are embellished with further layers of woven cloth, applique, stitching or quilting. It's not a craft that rates highly on producing a useful outcome but, as I've already mentioned, the process is engaging. Jude Hill's use of recycled textiles comes from a deeply held anti-consumerist philosophy. While I admire her stance, I live my life differently. But I like the soft, worn quality of used textiles and I've always found it difficult to throw away clothes I've worn out - particularly when I've loved the fabrics. So, my block so far is made from the remnants of two old pairs of linen pants worn to holes, a stained and torn batik cloth I've had for decades, and backed by an old sheet from my mothers's house - torn, but saved because of its hem-stitched edging. I'll soon run out of fabrics I can recycle, so I imagine that if this interest continues I'll be visiting second-hand shops for suitable scraps. For my knitting friends - don't fear this means an abandonment of knitting. My Sempervivum shawl is currently blocking and I've just cast on for a new cardigan for my grand-daughter. I just have more time to fill with such activities than I used to have. Purl and plain - in all sorts of combinations. I was listening to Radio National Breakfast this morning when the presenter, John Doyle, had a brief, informal interview with the Prime Minister, Julia Gillard. They discussed the break she'd taken over the Christmas / New Year period and he asked the PM what she enjoyed doing in her 'down' time. She mentioned the pleasure she took in knitting. John Doyle has the most ironic voice on radio - perhaps even in the entertainment business more generally. I never know when he is sending someone or something up or when (if ever) he is being serious. He compared her knitting to the leisure pastimes of previous PMs - Empire clocks and Mahler (Paul Keating), punting and sport (Bob Hawke) reading and history (Gough Whitlam). He commented that he really didn't get knitting as a hobby - though I'm not sure whether he was sending himself up with this comment. The thing that’s good about the knitting is that it takes up enough of your attention that your mind can’t race at a million miles an hour, but it's repetitive and soothing, so it helps you transition from work. 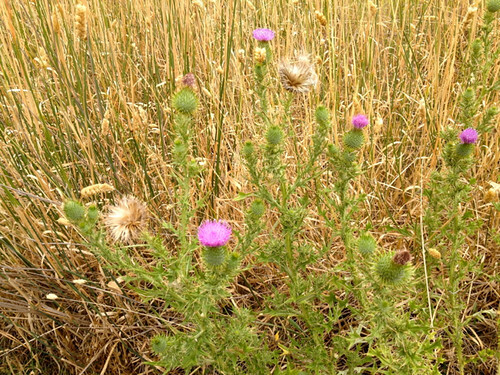 She summed it up as 'purl and plain - in all sorts of combinations'. I love the fact that we have a Prime Minister who is a knitter. I'm running rather late with my knitting summary for 2012 and have chosen a rather strange day to write it. It's currently 42 degrees celsius (about 107 fahrenheit) in Sydney with a dry, hot wind. Not really the kind of day when knitting springs naturally to mind. But the new year inevitably brings with it thoughts of planning for the rest of the year and an implicit review of what was achieved in the past year. I have to conclude that I've achieved much less knitting than I hoped for. Fewer, and less significant items than in 2011, and that was already a decrease on 2010. I made a single resolution for knitting in 2012, which was to knit as whim and fancy led me. Unfortunately, whim and fancy have not proven to be productive leaders and I think I might have to choose a more ambitious strategy in 2013. So, what did I achieve? I completed 16 projects in 2012. All of them might be classified as 'accessories' or small projects. Six shawls and scarves, four pairs of socks, five hats and a baby cardigan. As for 2011, most of my knitting has been given away to friends and family, though I have achieved some additions to my wardrobe that have been well and constantly worn. I've also participated in a couple of group knitting projects that have been great fun - a jointly produced Wollmeise baby blanket for a friend, and knitted bunting for the NSW Knitters' Guild stall for the Royal Easter Show. 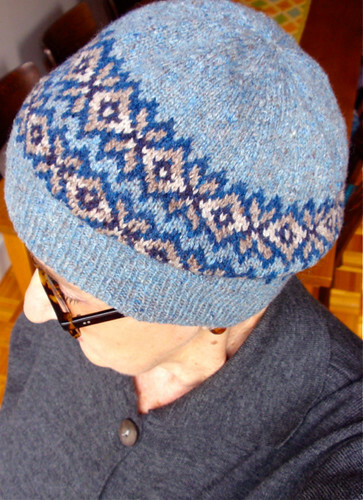 This is Jared Flood's Seasons hat pattern, bought as a kit in the 'summer' colour-way. As I commented at the time, I'm not a very skilled colourwork knitter. I can't knit ambidextrously and so changing colours while preserving the needed tension is difficult for me. But this hat worked well, with no puckering or obvious tension issues and, to my great pleasure, the inside was as neat as the outside. Maybe I can now attempt a more ambitious colourwork project. 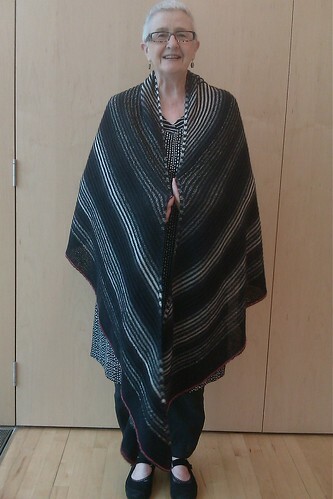 The most favourited of my projects on Ravelry was, by a huge margin, my Big Shawl. This is a minor modification to Stephen West's Transatlantic shawl. I'm not even sure I could call it a modification as the only change was that I kept knitting till I thought the shawl was the size I wanted. I've worn the shawl many times. It's large enough to wear it crossed in front with the long tails tied behind my back. This is unexpectedly elegant (if a bit eccentric) but also wonderfully cosy. Just what I wanted. The Big Shawl was a close runner-up for the prize for the most worn item, but in the end nothing could rival my Textures scarf, knitted to Heidi Kirrmaier's Windward pattern. 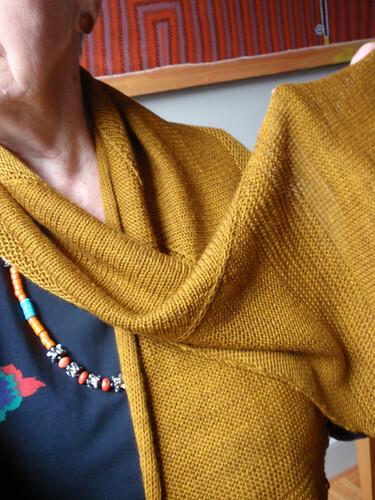 Unexpectedly, the brilliant mustard colour of this scarf suited me and seemed wearable with many of my clothes. I loved it and received many compliments from others. I want to knit this pattern again as it is so easy to wear almost anywhere. I could even wear it with jeans if I had any. And finally, the prize for the project that was most fun to knit. There is no doubt that this was the 'bunts' I knitted to contribute to the NSW Knitters' Guild's string of knitted bunting. There were several weeks before Easter when almost every knitter I knew was knitting bunts. Even people who initially were uninterested in the project were caught up in bunt mania. 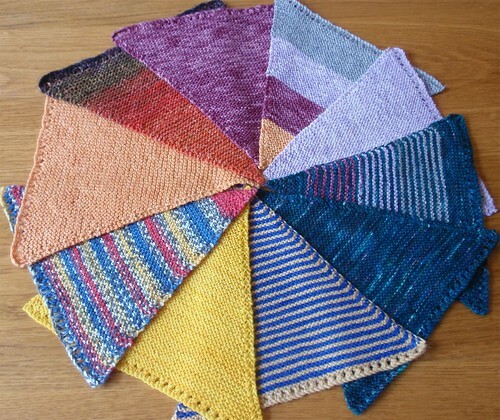 It was a wonderful way to use up odds and ends of sock wool in all colours and combinations. And we had the satisfaction of seeing the very lengthy strings of colourful bunting that resulted. Great fun. So, I'm not really satisfied with my 2012 knitting output. I like the things I've produced - I'm even very happy with some of them. But I don't feel I've challenged myself with my knitting or achieved anything major. Left to themselves, whim and fancy distract rather than inspire. I'm not sure just yet what I'll do for 2013. I think I need a bit of a knitting plan, but I don't want the kind of plan that becomes a tyranny rather than a guide. I'll have a bit of a think and report back.